About Downey Ranch - DOWNEY RANCH, Inc.
Downey Ranch, Inc. is a family owned operation started in 1986 by Joe Downey, a 3rd generation cattle producer. The 550 head cowherd is comprised of both registered and commercial cows. 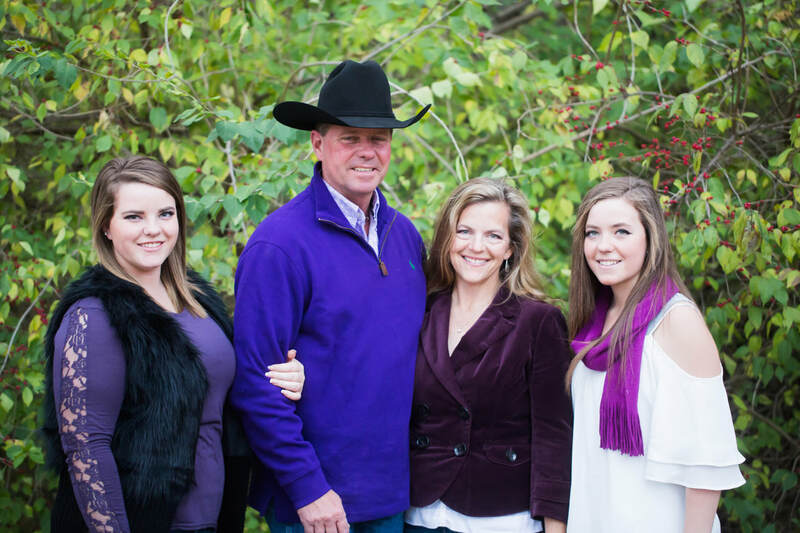 Currently, day to day operations are handled by Joe Carpenter and wife, Barb Downey along with daughters Anna & Laura. The ranch is located in the heart of the Kansas Flinthills southwest of Wamego, KS. This location has been an ideal one for our registered and commercial Angus cow herd. Since day one, we have been focused on beef quality. This focus has led to DRI being recognized nationally for producing high quality beef. In 1993, Downey Ranch won the Certified Angus Beef Value Discovery Project and in 1995, had the highest marbling pen of Angus steers in the 20,000 head Angus Alliance project held at Syracuse Feedyard. Always looking for new opportunity, we became involved with a new venture in 1997. DRI is proud to be a founding member & stockholder of US Premium Beef. We currently market all of our finished beef through this outlet, which rewards shareholders with premium prices for superior cattle. More important than high quality carcasses, we recognize that the first and most important job of a cow is to get a live calf to weaning every year with a minimum of assistance from us. She works for DRI, not the other way around. That means that she will have to settle during our 75 day season, gain condition on crop residue in the fall and early winter, calve out on open range and get that calf up and going on her own. Then her temperament, udder quality and ability to maintain adequate flesh had better meet our standards too. We've culled hard over the years and it shows. The success of the commercial operation led to our decision to enter the registered seedstock business in 1993. Since that time, DRI has been stacking pedigrees with the same proven Angus sires that led our commercial herd to repeatable high quality levels. We manage the registered cows in the same herd as our commercial cows and they're subjected to the same real world conditions. They are range cows; no feedbuckets, hormonal jumpstarts or tolerance for poor type or performance. Over the past several years, sales have been conducted first by private treaty and now by auction. Currently, we have an annual production sale on the first Friday in November here at the ranch where we offer registered Black & Red Angus bulls along with commercial bred heifers (see the Production Sale page). The auction is conducted with our good friends Kevin & Mary Ann Kniebel of Kniebel Cattle Company. Their operation consists of a registered Red Angus seedstock herd, a large commercial cow/calf operation, an on-ranch feedlot and extensive farming operations. Their business philosophy is consistent with our vision. Both families feel that we're qualified to assist you with your seedstock needs because we ARE commercial cattlemen. Give us a call or stop by anytime. We look forward to visiting with you about your needs and how they can best be met.